I have a portion of a web test I only want to run if a specific condition is true. 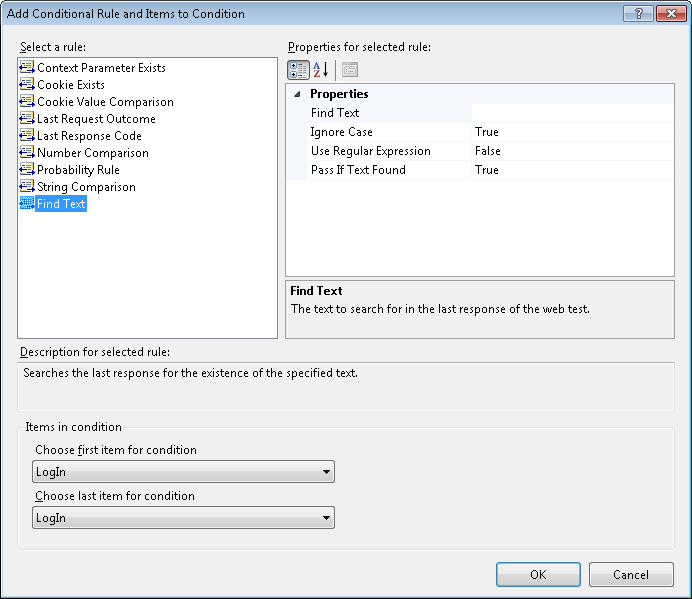 Use the new Visual Studio 2010 Conditional Rule Feature. However, the condition I wanted to test for was unable to be tested using the out of the box conditions. So in this posting I am going to show you how to write your own custom Condition Rule for Visual Studio 2010. /// Determines whether the condition was met or not. To create a custom Conditional Rule simply create a public class that derives from Microsoft.VisualStudio.TestTools.WebTesting.ConditionalRule and override CheckCondition. This class can be added directly to your test project or a separate class library referenced by your test project. From within the CheckCondition method set e.IsMet to true or false depending on if the condition was met. If e.IsMet is set to true all the request under this condition will be executed, otherwise, they will be skipped. Once your test project has a reference to the conditional rule class it will be shown in the Add Conditional Rule and Items to Condition dialog. Once the condition is added to your web test you will see the If statement with the selected requested nested underneath. The sample code is modeled after the Find Text Validation rule and exposes many of the same properties. The purpose of this condition is to search the last response of the web test for the existence or nonexistence of the specified text. If the condition is met the requests under this condition will execute, otherwise the requests will be skipped. To create a class just right click on the upper level of your class desired location. For instance a folder. Select Add -> Class is at the bottom and goes from there.